I want to thank you for being the inspiration for my rendition of Guy of Gisbourne in my upcoming novel, Hearken to Avalon. I truly appreciated your work in the BBC Robin Hood series. What hooked me to work with this character was an interview in which you spoke about your character’s flaws. He was undoubtedly damaged character. But what gave this character hope was his belief and desire for an enduring love. It made me wonder, if this villain had love returned to him; if his prayer had been answered, would he be different? If love were given to him freely, could a villain change? Could he rise up and become a champion? It made me question what defines a villain and a hero and how love can affect one on deep and mysterious levels. In Hearken to Avalon, the character, Guy of Gisbourne gets a complete makeover. But as I am sure you appreciate this historical villain, you may love his transformation in my story. Please check out my Indiegogo campaign at: http://igg.me/at/hearkentoavalon And if you appreciate the premise of the story (see below), consider joining me and others in raising funds to publish it. Additionally, I would be delighted to send you a draft if you are interested in reviewing it. If you enjoy the story, I would love a testimonial from you, speaking to the work’s merits. You have a wide fan base and for those who loved your rendition of Guy, may feel heartened to read that my Guy gets a new lease on life. Those who are in power in any given era determine whose stories are saved for posterity and how their characters are portrayed. Guy of Gisbourne, a notorious villain hounding the good people of Nottingham? Morgaine, Lady of the Lake; enchantress; evil sorceress? I was deeply inspired to offer a revision of how these notable historical figures were cast centuries ago. Guy of Gisbourne and Morgaine Avalon, future Duchess of Glastonbury, descendant and namesake of the legendary King Arthur’s half-sister, are drawn together by the mysterious workings of the Faie. Their story is one of love that completes itself as Guy claims his destiny as the Stag King and comes to Avalon’s aid once again. Learn a perspective as to why Guy of Gisbourne comes to be associated with wearing a horse’s hide. Read why he has issues with the Church. Discover why he comes to be so loved by Morgaine of Avalon and enters a new story, leaving his old one behind. Meanwhile, stories about Guy’s demise ran amok. Robin decided to let the folks of Nottingham think what they will. Several tales circulated; some more believable than others. Did the Sheriff truly run Guy, his right hand, out of town? Another story was that the Sheriff slit Guy’s throat in the castle during one his tantrums. Yet another was that a love struck Guy ran off with a mysterious lady back to her home in a lake. In a lake? Yes, she was a water spirit and witch, and made her home in a lake near the shores of the Isle of Apples. It had been witnessed that four Black Knights turned on their own and beat Guy to death and dragged his body out of town to be dumped in an unmarked grave. The one story that topped all the tales was of Nottingham’s cherished hero, Robin Hood, dueling the villainous Guy on the King’s Road and Robin running the rogue through with a sword. One even heard tell that the good Robin of the Hood, beheaded the cruel traitor, Sir Guy of Gisbourne, and threw him in a shallow grave. A ballad about the duel was even created and sung around the fireside. It is incredible what a pronounced hero can get away with and what can be accredited to him. There were no inconvenient questions asked of Robin because everyone preferred to believe that heroes defeat villains and that there were distinguishable traits that could easily tell the two apart. As their lips touched Guy felt in the grasp of something ancient, dangerous, and too powerful to turn away from. Not that he wanted to; he was utterly entranced by the Lady Morgaine. Kissing Morgaine was magic. And oddly freeing. It felt like the rest of the world burned away and his only purpose was to love this lady. Their hunger grew with a rapidity that could only be likened to a fire being plunged into oxygen. Sparks flew up in their hearts as they kissed. Passion ignited their souls. When they broke away they were visibly breathless. “Did you feel that?” she asked in awe. Morgaine took in Guy’s words. She began to allow herself to rise up in this feeling called love. She smiled and Guy too, felt his heart rise in love. All thoughts and feelings of his tortured love for Marian, a woman of Nottingham, who had spurred his advances time and again, fell away. In fact, everything else fell away in that moment. His soul soared and he could feel Morgaine’s beside him. Welcome to Hearken to Avalon! Contribute to the fundraising campaign and help publish this novel. By participating in the publication of Hearken to Avalon, you are condoning rebalancing of power relations between genders, supporting a work that puts the Environment at forefront rather than as mere backdrop, and backing a project the offers tangible examples for growing compassion, honesty and self-love in a world increasingly rife with peacelessness, lovelessness, and polarized viewpoints. You are welcome to forward excerpts of this novel as long as you credit and tag the author, Arianna Alexsandra Collins. 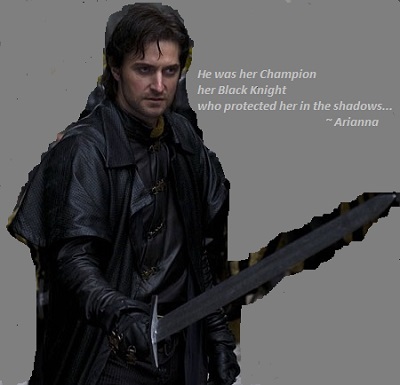 This entry was posted in Historical fiction, Love story, Novel, Romance and tagged Arianna Alexsandra Collins, Avalon, Faie, Guy of Gisbourne, Hearken to Avalon, Richard Armitage. Bookmark the permalink.